The tree is erect, short-trunked, slender or spreading; reaching to 15 m in height, with red-brown or yellow-brown, furrowed bark. Its leaves are pinnate, up to 50 cm long, with 5 to 7 alternate leaflets, obovate or elliptic-oblong, pointed at both ends (7-20 cm long, slightly leathery, dark-green and glossy on the upper surface, paler and dull beneath, and with prominent midrib. Small, white or pale-yellow, fleshy, mostly bisexual, flowers are home in simple or branched racemes which may be solitary or in hairy clusters on the trunk and oldest branches, at first standing erect and finally pendant and 10-30 cm in length.The fruit, borne 2 to 30 in a cluster, is oval, ovoid-oblong or nearly round 2.5 - 5 cm in diameter, and has light greyish-yellow to pale brownish or pink, velvety skin, leathery, thin or thick, and containing milky latex. There are 5 or 6 segments of aromatic, white, translucent, juicy flesh (arils), acid to subacid in flavour. Seeds, which adhere more or less to the flesh, are usually present in 1 to 3 of the segments. They are green, relatively large 2 - 2.5 cm long and 1 - 2 cm wide, very bitter, and sometimes, if the flesh clings tightly to the seed, it may acquire some of its bitterness. The peel of the langsat is easily removed and the flesh is commonly eaten out-of-hand or served as dessert, and may be cooked in various ways.Varieties with much latex are best dipped into boiling water to eliminate the gumminess before peeling.The peeled, seedless or seeded fruits are canned in syrup or sometimes candied. The langsat is ultra-tropical. Even in its native territory it cannot be grown at an altitude over 750 m. It needs a humid atmosphere, plenty of moisture and will not tolerate long dry seasons. Some shade is beneficial especially during the early years. The tree does best on deep, rich, well-drained, sandy loam or other soils that are slightly acid to neutral and high in organic matter. It is inclined to do poorly on clay that dries and cracks during rainless periods, and is not at all adapted to alkaline soils. It will not endure even a few days of water-logging. 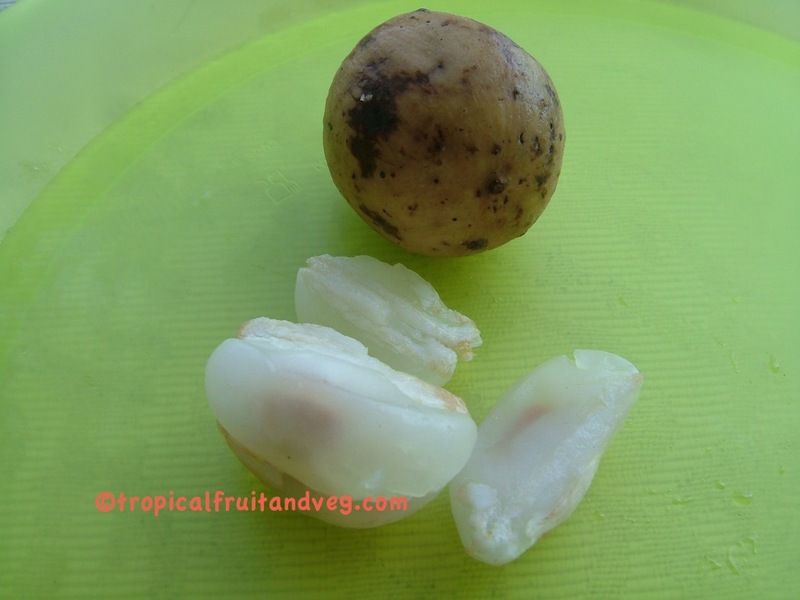 Langsats are commonly grown from seeds which must be planted within 1 or 2 days after removal from the fruit. Viability is totally lost in 8 days unless the seeds are stored in polyethylene bags at 4� - 6� C where they will remain viable for 14 days.Seedlings will bear in 12 to 20 years. Air-layering is discouraging, as the root system is weak and the survival rate is poor after planting out. Shield-budding has a low rate of success. Cleft- and side-grafting and approach-grafting give good results.